West Windsor, N.J. – With a mission “to stimulate an interest in gardening, encourage the conservation of plant and wildlife, and take part in community gardening projects,” the Dogwood Garden Club of Princeton has chosen to nurture Horticulture students at Mercer County Community College for decades. In what some members describe as the event that marks the official start of their holiday season, the club's tradition of generosity continued on Dec. 5 at a fundraising luncheon at Green Acres Country Club in Lawrenceville. More than 150 garden enthusiasts attended the festive event. Proceeds will be donated to the MCCC Foundation to be awarded for student scholarships. In recent years, the club has increased its giving to $3,000 annually. According to club officer and event chair Doris Mapes, of Princeton, the turnout for the event was great this year. "We support MCCC students because we encourage new gardeners. We know that some students might not be able to attend Mercer without our support.” Mapes’ co-chair for the event was Mary Lee Eldridge. 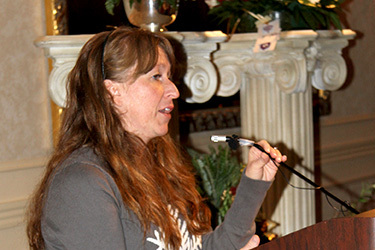 The club’s president is Diana Cedeno. The group welcomed MCCC faculty member Amy Ricco, coordinator of the Horticulture/Plant Science programs, who shared stories about the scholarship recipients. “Students come to us with a lot of different career goals,” Ricco told the crowd. She noted that this year’s recipients range from recent high school graduates to career changers. The 2013 recipients include Tre Foster, a graduate of the Sypek Center’s Landscape program, who hopes to transfer to Rutgers University and complete his bachelor’s degree in Landscape Architecture; Michael Gerheiser, a career changer who is currently working on MCCC's display for the Philadelphia Flower Show in March 2014, the first time Mercer will have an exhibit since the 1970s; Kristen Grover, a career changer who has been taking night classes while working full-time (Grover recently accepted a job with Kale’s in Princeton); Jenelle Lombardo, who has returned to Mercer to finish her degree and gain skills to assist her mother, who maintains plants for offices and business complexes; Jo Ann Nalavade, who is passionate about landscape design and has been volunteering at the William Trent House in Trenton; and Diane Shongo, a retiree and master gardener who has spent time helping students in Camden build school gardens. 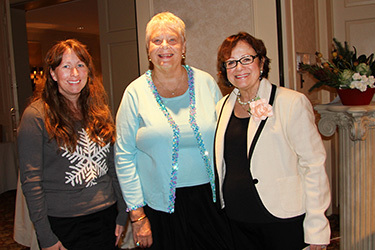 Event Chair Doris Mapes, center, and the club's president, Diana Cedeno, right, with MCCC Associate Professor of Horticulture Amy Ricco. Ricco thanked attendees and shared the goals of this year's scholarship recipients. 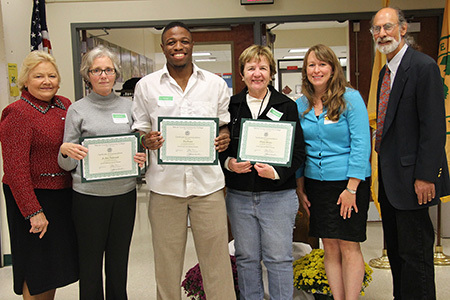 Horticulture students, second from left to right, Diane Shonyo, Tre Foster, and Jo Ann Nalavade were among six students to receive scholarships from the Dogwood Garden Club in October. They are pictured with President Patricia C. Donohue, far left, Horticulture Program Coordinator Amy Ricco, second from right, and Dean of Liberal Arts Robin Schore.